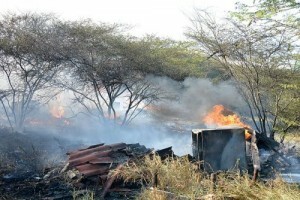 WILLEMSTAD - Almost every week it's the same problem; bush fire at the Veeris area. It happened yesterday again. And this time it was a big one. It had a huge smoke development as a consequence. The fire brigade had difficulty reaching the bush fire. In addition, the fire was so large this time that other units were also called for extinguishing. Neighborhood residents say that they know who started the fire and they already reported this to the police. But so far no one has been arrested.